At the beginning of this month, the Republic of Singapore Navy (RSN) officially unveiled its new unmanned surface vehicle (USV), the Venus 16 . The vessel is 16m long and 5m wide, has a maximum speed of 40 knots, boasts advanced sensors, and can stay at sea for more than 36 hours. This development highlights the emerging role  of unmanned maritime vehicles (UMVs) in maritime security. While the mainstream discussion of the drone industry focuses on unmanned aerial vehicles (UAVs), the potential contribution of UMVs to maritime security is somewhat under-discussed. One particular area that hasn’t received much attention is the use of UMVs for Australian border protection. Securing Australia’s maritime environment is a mammoth task, with responsibility for almost 35,000km  of coastline and 14%  of the world’s oceans. The Australian Defence Force (ADF) and Australian Border Force (ABF) together confront a mixed bag  of maritime threats including illegal fishing, drug and people smuggling, search and rescue operations, as well as anti-surface and anti-submarine warfare (ASW). But given the size of the area to be covered, detecting threats could be like finding a proverbial needle in a haystack. The ADF coordinates with ABF to maximise the utility of their respective assets in meeting this task, but Defence retains the lion’s share of maritime surveillance capability. The ADF employs a variety of assets including the Jindalee Operational Radar Network (JORN), RAAF P-3 Orions and RAN Armidale-class patrol boats. ABF employs Dash 8 aircraft and the Cape-class patrol boats in nearer waters to help create a layered maritime surveillance capability. The government also plans to replace  the Orions with 8-12 manned P-8 Poseidons and up to seven MQ-4C Triton UAVs in the near future. 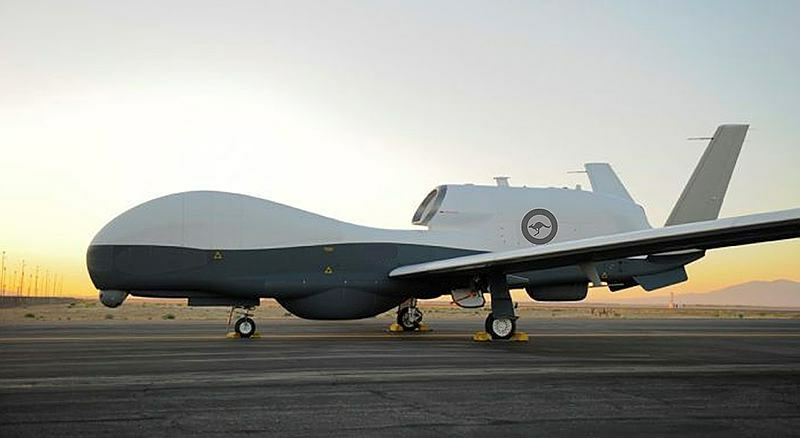 The agility of aerial surveillance makes it an appealing choice for monitoring Australia’s extensive waters, and the Triton UAV is particularly adept—able to fly for over 24 hours  at a time and survey an area of around 7 million square km  per mission. But it’s not without its limitations. UAVs offer endurance in flight time but, like a torch in a dark room, they can only illuminate one area at a time. One is forced to decide between loitering over a small area for sustained periods of time for persistence, and travelling across vast areas for the sake of operational scope. Short of keeping several platforms in the air at any given time, much of the environment remains completely unsurveilled, most of the time. Of course, we could keep several platforms in the air, but this leads to the second problem: UAV platforms may boast superior efficiency in relation to manned platforms, but they are still dependent on fuel and require constant maintenance—this can be expensive . For example, the cost per flying hour of the RQ-4 Global Hawk (from which the Triton is derived) was recently measured at US$18,900 . Those expenses are in addition to substantial acquisition costs . While currently in adolescence compared to the well-established UAV industry, future generations of UMVs may offer an energy- and cost-efficient supplement to aerial surveillance systems. If they can be built cheaply enough, passive surveillance by a large number of cheap platforms could be very effective. The Australian-built Ocius Bluebottle  Unmanned Surface Vehicle (USV) is a good indication of the direction that the industry is headed. The Bluebottle consumes no fuel, instead making use of solar and wave energy for power to stay at sea for ‘weeks or months at a time .’ The Stinger is a 5.8m variant of the Bluebottle being produced for the Department of Defence, and will include a towed-array sonar system  as a proof-of-concept submarine detection platform. In the underwater domain, the US Navy’s LDUUV can already operate  independently for up to 30 days at a time, but this is expected to extend to months or even years. A semi-permanent ‘net’ of UMVs could be established along stretches of key coastal vulnerability to detect submarines, surface vessels and aircraft. Those autonomous and energy-efficient drones could act as a line of first detection, cuing other assets like the Triton or Poseidon. That would reduce strain on aerial platforms, allowing them to be used to make more targeted flights  in response to detections. Not all UMVs will be energy self-sufficient. The significant power requirements of radar and active sonar technologies will necessitate investigating various modes of power generation, but the potential for innovation in this industry is immense. The global UMV market is expected to be worth more than US$15 billion  in the next decade alone. The US has recognised the importance of development in this area. Director of the US Naval Nuclear Propulsion Program, Admiral Frank Caldwell, has described  investment in unmanned maritime drones as a strategic ‘imperative.’ Work is already underway around the world at DARPA , the US Navy and private corporations like Liquid Robotics  and Ocius . Despite the efficiency of aerial surveillance platforms, surface platforms promise to be a vital part of maritime security strategies. As the Singaporean Venus 16 platform demonstrates, UMVs are an increasingly attractive substitute for manned vessels in this effort. Monitoring this up-and-coming technology is advisable in order to capitalise on its potentially invaluable contribution to Australian border security. Zoe Hawkins and James Mugg are research interns at ASPI. Image courtesy of Department of Defence.